Saddle bronc riding evolved from the task of breaking and training horses to work the cattle ranches of the Old West. Riders in this event must mark out their horses on the first jump from the chute. To properly mark out his horse, the saddle bronc rider must have both heels touching the animal above the point of its shoulders when it makes its first jump from the chute. If the rider misses his mark, he receives no score. 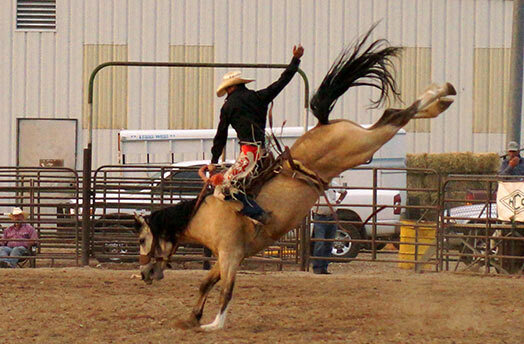 The saddle bronc rider has only a thick rein attached to his horse's halter. Using one hand, the cowboy tries to stay securely seated in his saddle. If he touches any part of the horse or his own body with his free hand, he is disqualified.